HMCS Ojibwa is nearly home. Home, for the last of Canada’s Oberon class submarines, is the Elgin Military Museum in Port Burwell, Ontario on the north shore of Lake Erie. When it was decommissioned from the Royal Canadian Navy in 1998, the vessel was destined to be scrapped, but a movement to save the ship resulted in it becoming the property of the museum. The plan is for the museum to turn the HMCS Ojibwa into a land-based historical artifact located next to the Elgin Military Museum of Naval History—a submarine interpretation centre—and now that plan is entering its final stage. The sub arrived at the port November 27th. 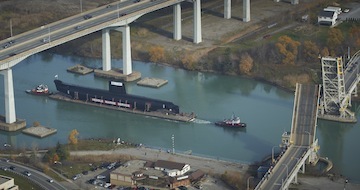 It was originally scheduled to have arrived the week before, but ongoing dredging work at the port proved insufficient to provide clearance for the sub and the barge that carried it from Hamilton, Ontario. With the work complete, and an obstruction (believed to be an old seawall) cleared, the barge and sub were free to dock. 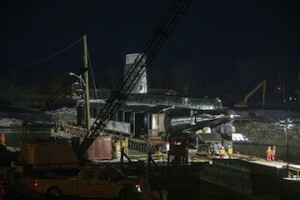 On November 28th, 2012 the sub is to be lifted off the barge and placed into the concrete cradles that will be its permanent home. Heavy lift and transport company Mammoet Canada Eastern Ltd and Heddle Marine will work together to carefully shift the weight of the submarine from the barge using 48 axle-lines of self-propelled modular transporters (SPMTs). The SPMT trailers will be assembled and rolled onto the barge using ramps, which will provide the transition between the barge and the shore. On the barge, the SPMTs are positioned under the transportation stands and the submarine is then hydraulically elevated. When the submarine is secure, the roll-off procedure will use a ballast plan that consists of filling the barge compartments with water as needed to maintain a level position and avoid undue stress on the barge and submarine. Once it has been successfully rolled off the barge, HMCS Ojibwa will be transported to its final resting place and positioned onto its permanent mount at the museum. The submarine has spent the past few months making its last voyage from Halifax, Nova Scotia to Port Burwell, with a stop in Hamilton where it underwent some refurbishing. “Ojibwa presented a unique opportunity to bring the story of Canada’s role in the cold war and our entire rich naval history to central Canada. She began her service in the height of the Cold War earning herself a proud place in Canadian history,” says Ian Raven, executive director of the Elgin Military Museum. The Ojibwa is the second Canadian submarine to be turned into a museum exhibit. The HMCS Onondaga is an Oberon-class (as is the Ojibway) sub that now resides at the Site historique maritime de la Pointe-au-Père in Rimouski, Quebec, and is open to the public. This entry was posted in The world's submarines and tagged Canada, Elgin Military Museum, HMCS Ojibwa, Oberon Class on December 12, 2012 by jasonlockley.